Initially used during the 1970s and 1980s as an application for tissue repair and hemostasis prior to its subsequent application in orthopedics and odontology, autologous (meaning when the donor individual is the same as the recipient) use of platelet-rich plasma (PRP) has more recently demonstrated considerable benefit in cosmetic surgery. 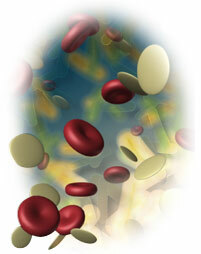 The growth factors contained within platelets stimulate healing and the generation of new tissue structures. Regarding their specific application to hair restoration, these factors have been postulated to act in the bulge area of the hair follicle (one of two regions where stem cells are concentrated) as well as interacting with matrix cells to activate the proliferative phase of the hair cycle. Essentially, these factors concentrated in PRP serve to enhance the messaging between to the two stem cell-enriched regions of the hair follicle (the bulge and bulb) in order to facilitate regeneration of a future intact follicular unit (FU). 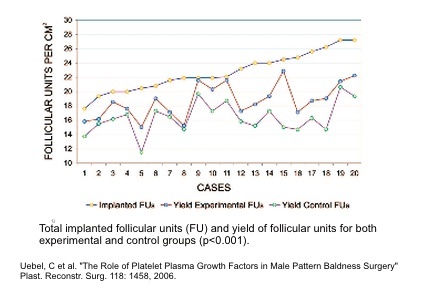 In a clinical setting, the effect of PRP appears to further minimize the elimination or scalp absorption of a small percentage of implanted FU during the months following surgery (see figure above). By facilitating the re-acclimation process of each follicle that begins upon re-implantation, the inclusion of PRP enables a greater percentage of follicles to remain viable as they pass through the catagen and telogen phases prior to initiating a new anagen (growth) phase. The improvement in overall survival of transplanted FU coupled with the minimization of temporary loss of pre-existing hair results in an increased overall hair density after hair restoration surgery. In summary, PRP represents a safe and potentially beneficial supplement in HRS to both the donor and recipient areas. 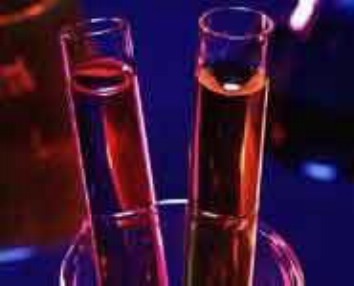 More in-depth research is currently being conducted by Dr. Wesley to elucidate the optimal concentration of PRP that will provide the most benefit to HRS patients.